In February we introduced the concept of brand identities for the first time. It was our goal to provide you with a way to establish a uniform look and feel across your email, website and social media channels. Since then, we’ve seen many retailers successfully implement brand identities and have been hard at work to bring you more. As a reminder, a brand identity is the visual representation of your store and how consumers perceive it. A strong brand identity helps better communicate your messaging effectively and build trust between you and your customers. 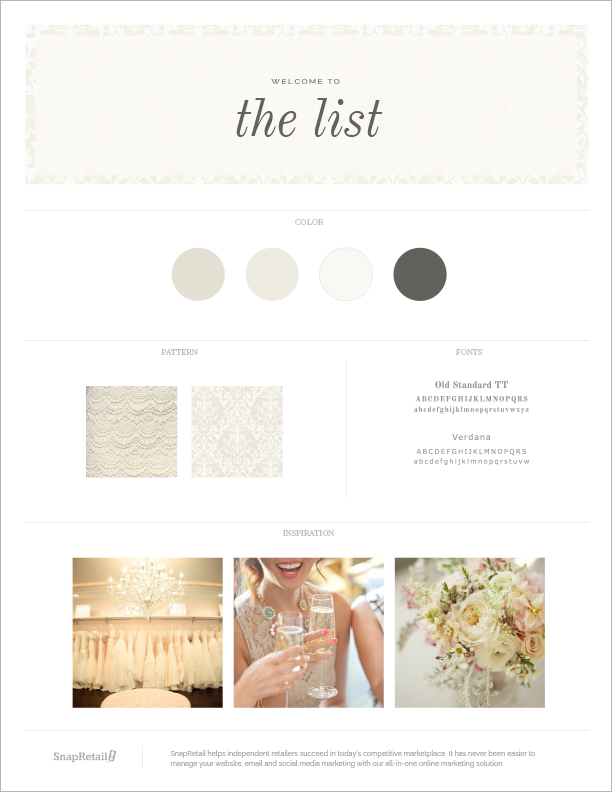 The Elegant theme makes use of neutral hues to create a soft and welcoming feel. Elegant makes the the perfect fit for a boutique or a store with a feminine personality. The baroque pattern paired with the serif font, Old Standard TT, provides a sophisticated identity. Our 1950’s inspired Retro brand identity includes a boomerang pattern that will add retro flair to your marketing. This theme was designed to reflect a trendy attitude; cool hues of mint, coral accents and bold textures. 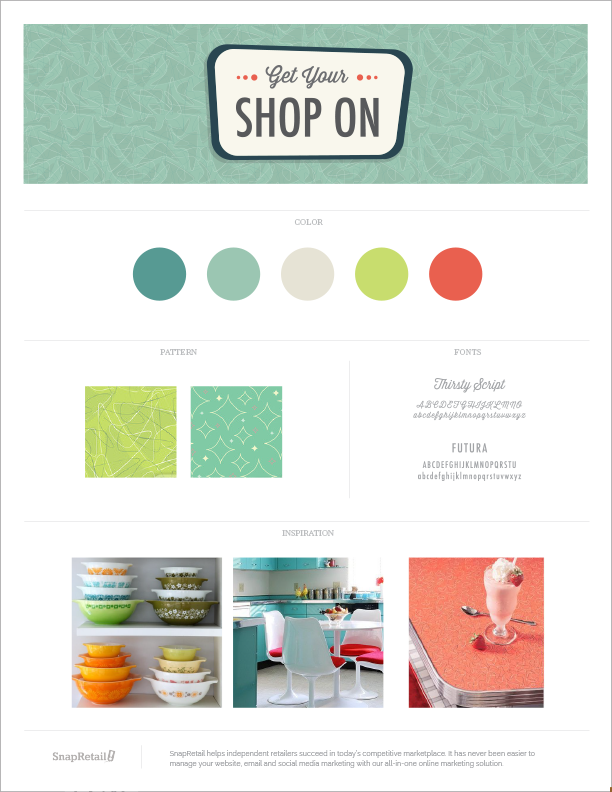 This identity will showcase your store’s products and messaging in a fresh and fun way. *HINT: The web theme RETRO, compliments this brand identity best! Our Modern brand identity was created out of bold Mid-Century Modern influence., using subtle geometric patterns and the clean font Diner. 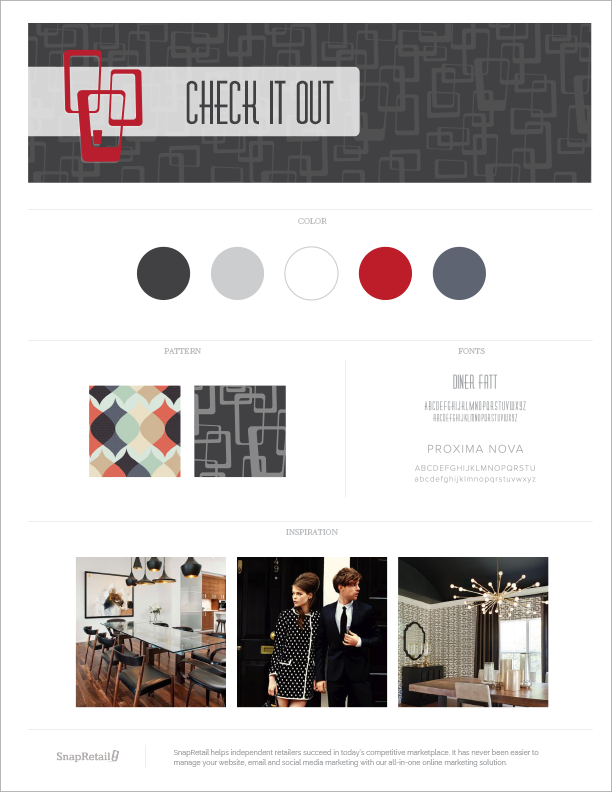 Shades of gray and a bold pop of candy red will allow your products to grab the spotlight. *HINT: Choose web theme MOD for a consistent brand identity. Your SnapRetail brand identity goes beyond email and website. Take your branding to the next level by using branded social images (see below). Remember, the goal is to strengthen the connection you have with your customers as well as the integrity of your business. If you can’t find a brand identity that matches your stores’ current personality, leave us some feedback in the comments and our next round of brand identities may be inspired by you! Log in now to see the new brand identity content for yourself!